There's nothing like a glass of wine to propel you on your pilgrimage along Europe's Camino de Santiago, also known as St. James Way. Fortunately, for visitors to the route who pass through Navarra, Spain in the northern part of the country, Bodegas Irache winery offers just that via a special wine fountain attached to the Monastery of Irache in Ayegui. 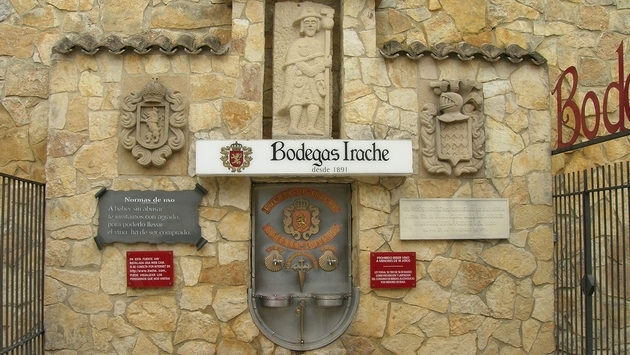 "On one of the walls facing the Pilgrims' Way to Santiago, Bodegas Irache has a Wine Fountain, so that pilgrims can serve themselves a free glass of wine to spur them on their way," the winery's website states. In addition to the fountain, which opened in 1991, the winery boasts a museum featuring hundreds of "old pieces related to wine" inside of a 19th century building. The fountain is open from 8 a.m. to 8 p.m. local time daily. That said, travelers can begin or end their journey with an aperitif. If only there was a complementary cheese fountain. More recently, a vineyard in central Italy's Abruzzo region opened a 24-hour wine fountain serving up red wine to thirsty tourists.